A good day for US girls on Tuesday turned into a great second round overall Wednesday with six more American girls picking up wins at the US Open Junior Championships. According to the USTA, the 10 US girls in the round of 16 is a record. (The draws were expanded from 32 to 64 in 1984). Those advancing on Wednesday included three seeds, a wild card, a qualifier and a lucky loser. Carson Branstine, the wild card of the group, had by far the most dramatic win, saving two match points in her 2-6, 7-6(7), 6-4 win over No. 2 seed Olesya Pervushina of Russia. Branstine, who will turn 16 on Friday, had a 5-1 lead in the second set, but couldn't hold on to it, and faced a match point serving at 5-6 in the tiebreaker and with Pervushina serving at 7-6. Both times, Branstine went for her forehand and made it, the first time with a clean winner and the second time forcing an error. "I figured if I'm going to win today, I'm going to have to go for it," Branstine said. "If I'm going to lose, I want to lose the right way. I knew if I was going to take a girl down who was that good, I had to be aggressive and keep pushing on her." Branstine can be critical of herself and voice those complaints loudly on the court, but she didn't succumb to those emotions Wednesday, even when she fell behind 3-0 in the final set. She cited two reasons for that, the New York fans and USTA coach Kathy Rinaldi. Although Rinaldi works primarily with young pros now, she has continued to mentor Branstine, and was at the match today. "She's worked with me in the past and ultimately deals with my schedule, she kind of the leader of what I do with my tennis," Branstine said. "She helps a lot, through everything. I love Kathy so much. Every time she watches me, I just feel more comfortable. I like her on the sideline cheering for me. She makes me feel really confident. Something about her there just gives me that extra push." A large crowd gathered around Court 6 for the tiebreaker, and Branstine didn't want to disappoint them. "Having the crowd on your side, in your home country, all the people are rooting for you mainly because you're American. They want to see Americans winning and doing well. I don't even think about being frustrated when I lose a point, because everyone's there and they just want you to do well so badly, it just makes it a lot easier to stay calm." Branstine won five straight games in the final set, with her first serve there when she needed it most. "My serve came in clutch today, but I have to give it to her, she served amazing. I don't know how many aces she hit, but it seemed like a million," said the Orange, California resident. "But I got my serves in at the right time." Serving for the match, Branstine got three first serves in with Pervushina failing to get two of them in play. With three match points at 40-0, Branstine missed her first serve, but converted the match point anyway, when Pervushina's forehand went wide. "I feel amazing," said Branstine. "It hasn't really sunk in yet. I've been putting in a lot of hard work and coming into this tournament, I was really excited, so to get a win like this is a big confidence boost for sure. I'm really, really happy." The qualifier advancing to the round of 16 is Kylie McKenzie, who is no stranger to success in New York, having reached the quarterfinals last year as an unseeded wild card. Her 6-2, 6-2 win over Paula Arias Manjon of Spain was much tougher than the score would indicate, especially the second set, but the 17-year-old from Arizona is now 7-2 at the US Open (including qualifying), the only junior slam she's played. "The energy here, and obviously playing for the US, representing American players, is such a big deal," McKenzie said. "It's just an exciting place to be, every time I come here. It is my favorite tournament." 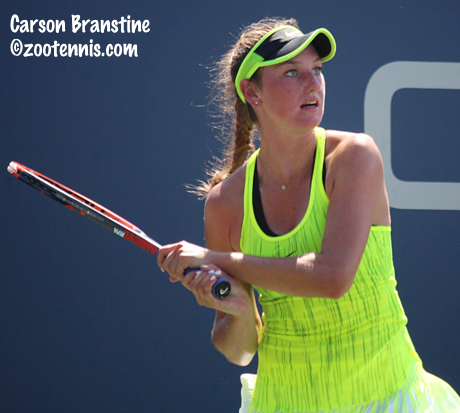 Although she had reached the final eight last year, McKenzie wasn't looking to match or exceed that this year. "I didn't put pressure on myself for results, even though I did well last year," McKenzie said. "I was just coming here to compete as hard as I could, just to play my best, having confidence, knowing I'm feeling a lot better about myself on the court. I feel like I felt before, and I know I've improved on so many things too. Even though I had some time off and some struggles, there's still things you can work on and I just feel stronger and more confident on the court." 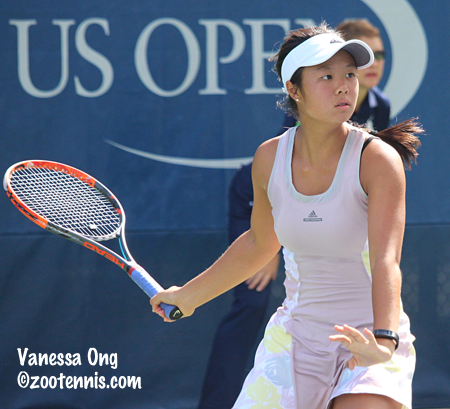 Lucky loser Vanessa Ong believes her secret weapon is her complete lack of expectations. After getting in when French Open girls champion Rebeka Masarova of Switzerland didn't show up, Ong beat San Diego 18s finalist Nicole Frenkel in the first round and ITF No. 40 Malene Helgo of Norway 6-4, 6-4 today. "I still had that mindset of nothing to lose, and she kind of got tight," said the 14-year-old from Oklahoma. "I feel free, and like I can do anything." Being much younger than most of the players in the draw, Ong has little experience with any of those competing this week, and she couldn't find anyone to help with scouting Helgo. "Nobody knew anything. We tried to find something, but no one knew anything," said Ong, who then had to work it out for herself after falling behind a break in the first set. "I think I did well just staying solid and controlling my nerves. I figured out that she liked power and that her shot tolerance was not very high. I just kept the ball in and tried to move her, and it worked." With so many Americans left in the draw, they must play each other on Thursday, with three such battles on the schedule. Ong will play No. 16 seed Alexandra Sanford, who beat qualifier Pranjala Yadlapalli of India 5-7, 7-5, 6-2. McKenzie plays No. 5 seed Kayla Day, who beat qualifier Shelly Krolitzky of Israel 6-4, 6-3, and in a matchup decided yesterday, qualifier Ashley Lahey will face No. 8 seed and 2015 finalist Sonya Kenin. Branstine plays No. 15 seed Yuki Naito of Japan, and No. 9 seed Usue Arconada, who beat Ayumi Miyamoto of Japan 7-6(2), 7-6(3) today, plays No. 7 seed Bianca Andreescu of Canada. Arconada defeated Andreescu in the round of 16 at the Wimbledon Juniors this year. No. 4 seed Amanda Anisimova faces No. 13 seed Viktoria Kuzmova of Slovakia on Thursday and Taylor Johnson plays Tessa Andrianjafitrimo of France. 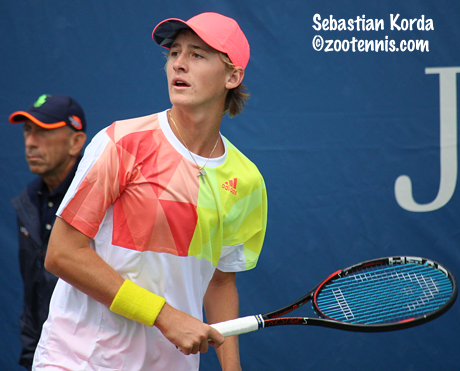 In the boys round of 16, three Americans remain: qualifier Patrick Kypson, wild card Sebastian Korda, and JJ Wolf. Unlike with the girls however, it is just bad luck that Wolf and Kypson will play in the round of 16. Wolf got there by virtue of a 6-1, 6-3 win over No. 4 seed and French Open boys champion Geoffrey Blancaneaux of France. "I played very solid, stuck to my game plan well," said the 17-year-old from Ohio. "I tried not to overplay, everything solid, hit to the big parts of the court. The points were long and very physical, as you'd expect from a great clay court player like him. My serve was up and down, but in the end, I could get the first serve in so that was what was important, returns and serves." Wolf's game plan is not specific to a particular player. "It's to do everything they're doing a little bit better," said the Ohio State recruit. "So if they're hitting cross court, I'll hit cross court maybe a foot deeper, or two miles per hour harder, and eventually they'll wear down." 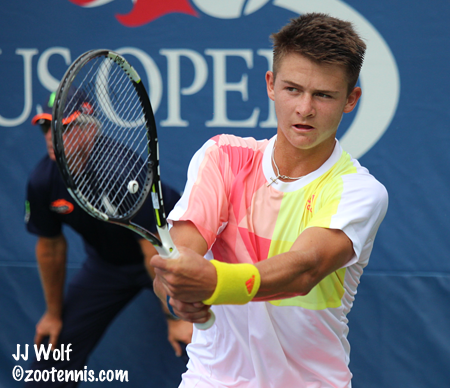 Kypson defeated Vlad Andrei Dancu of Romania 6-4, 6-1, to reach the round of 16 in his second junior slam. "It's come together pretty nicely this week so far," said the 16-year-old from North Carolina. "I actually really enjoy playing qualifying, getting through those matches. The qualies actually gave me a lot of confidence, because usually in the first round, it's your first match and you don't know how you're going to play." Kypson had another reason for his confidence: serving as a hitting partner for Andy Murray on Sunday. "I hit well and we did a bunch of drills," Kypson said. "Ivan [Lendl] was asking me to slice a lot, because he was playing Grigor [Dimitrov]." Although being brought in to work out with one of the world's elite players can be overwhelming, Kypson's relationship with Lendl, who has worked with several young players for the USTA, helped calm the nerves. "It helped that I knew Ivan, because he can also help me in that situation," Kypson said. "It was definitely helpful to have Ivan on the court, and not just Andy and Jamie [Delgado] and his physio or whatever. That kind of made it less intimidating." When he took the court for his first round match on Monday, his opponent, fellow qualifier Yuta Kikuchi was bound to seem less formidable. "The day before I was hitting with Murray," Kypson said. "Fifteen hours later, I'm playing Yuta Kikuchi from Japan. I guess if I can play with Murray, I can play with Yuta Kikuchi." Wolf and Kypson played a year ago in the semifinal of the Kalamazoo 16s, with Kypson winning 6-3, 6-4 en route to the title. "That was a tough battle, and I'm sure tomorrow it's going to be the same," Kypson said. "He's gotten a lot better and I've gotten a lot better, so it's going to be fun to go out there and play again." Korda, playing in his first Grade A event, came back to defeat France's Louis Tessa 5-7, 6-3, 6-2, after going down a set and a break. "I wasn't really happy with the way the set finished, and I was down a break in the second, but I just told myself, I'm playing the US Open, forget about everything and just enjoy yourself. I started playing a lot better, broke him back, broke him again, and in the third set, I just played really well." Korda, who received a wild card in the main draw after winning the 18s Clay Courts in July, said that final set was a top level for him. "It's the best set I've played in the past two months," said the Floridian. "I played well strategy-wise, everything positive, nothing negative, it was perfect for me." Korda, the son of 1998 Australian Open champion Petr Korda, is a bit surprised by his performance in his first junior slam. "I knew I was playing well, I didn't know I was playing this well," Korda said. "It shows me I can keep up with these guys, so it feels pretty nice right now." An excellent doubles player, Korda was in the draw with Nicola Kuhn of Spain, but an administrative error resulted in their removal from it. "We were in the draw for a solid six hours and they made mistake and didn't put another team in that was ranked ahead of us," Korda said. "Because we were the lowest ranked, they took us out." Korda plays No. 7 seed Yosuke Watanuki of Japan Thursday, who beat Liam Caruana of Italy 6-2, 6-4 today. The fourth US boy to play on Wednesday, No. 3 seed Ulises Blanch, retired in the third set of his match with Khumoyun Sultonov of Uzbekistan trailing 7-5, 6-7(6), 3-1. Blanch fought back from a break down in the second set to force the tiebreaker, but his recent illness, which is discussed here, left him short of the physical preparation he needed to get through a long three-setter. Like the girls singles, the girls doubles is filled with Americans, with four of the quarterfinalists from the United States and all four playing each other. Morgan Coppoc and Taylor Johnson will play USTA 18s National champions Jada Hart and Ena Shibahara and Kayla Day and Caroline Dolehide will play Wimbledon girls champions Usue Arconada and Claire Liu. Only one US boys team has reached the quarterfinals, with wild cards Sean Sculley and Nick Stachowiak, the USTA Kalamazoo 18s finalists, beating Karim Hossam and Ergi Kirkin of Turkey 3-6, 6-4, 12-10. They play the unseeded Japanese team of Toru Horie and Yuta Shimizu. Thursday's schedule does include four junior matches on Court 17, so streaming should be available for those at ESPN3.